It’s hard to admit your current CRM isn’t cutting it anymore. Maybe it can’t keep up with your company’s growth, or it’s lacking a key feature, or it’s simply not as good as the competition. Once you’ve come to terms with this decision, you’ll need to pick out which CRM you’ll switch to. Let’s recap what to consider. When choosing a CRM, look for a solution that’s cost-effective, well-reviewed and customizable. Bonus points if has a minimal learning curve and can be accessed on multiple devices. Being prepared, however, can make the process easier, so read on to learn the best methods for switching CRMs. It’s fairly common for the majority of the team to be enthusiastic, with a minority dissenting opinion. In this scenario, consider meeting privately with the holdouts to discuss their concerns. Usually, people are resistant because they don’t like change, not because the current CRM is superior. Convince them the cost of transitioning will be it in the long run, and you’ll reach 100% buy-in. Reaching total buy-in is more likely when you can convert one or two salespeople into advocates for the product. Once you have a couple of people using the product and raving about it, persuading the next four or five users to get on board is much easier. And after a certain number of people have made the commitment, there’ll be no going back. As you know, data is precious — so both Vajre and Harmon say carefully planning how you’ll import your team’s data from your current CRM to your new one is crucial. Are you using legacy software? 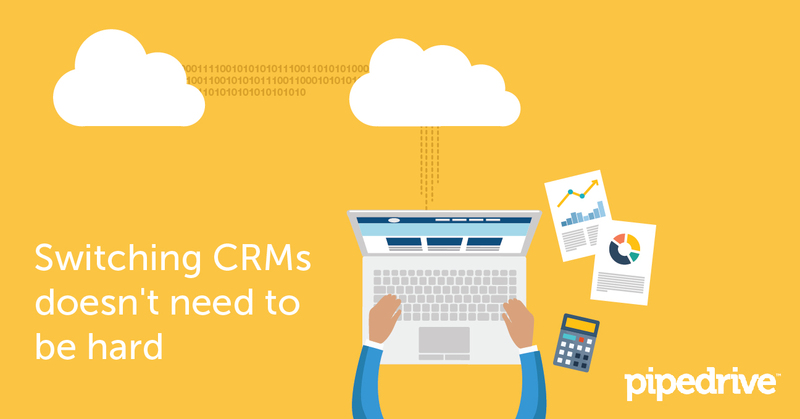 Moving from an in-house tool to the cloud is a smart business decision, but it means you can’t simply export your data to a spreadsheet and then pull that into your new CRM. You might want to hire a specialist who can facilitate the move for you. Even if your current system is fairly up-to-date, Harmon said it may have fields your new one does not. Maybe your existing CRM tracks how many product samples your reps have sent to individual customers, and this new one does not. Luckily, many CRMs let you add custom fields. Make sure you plan to add the relevant fields before you switch. You should also look at data migration tools like Import2, which let you import data from your current system into widely used CRMs like HubSpot, Pipedrive and Salesforce. There are a couple other points to consider. Are you going to bring over all of your data, or only records from the past year or two? Are there any values you’re logging right now that you don’t want to log in the new CRM? Do you have multiple databases that you need to merge and export? Once you’ve figured out how you’ll go about making the transition, it’s time to choose when. Setting a data is important for a couple reasons, Vajre explained. In addition, once you’ve set a date, you can schedule ownership, training and support — “which’ll make it less stressful for the person driving this massive change,” Vajre said. According to Harmon, agreeing to a firm date is also important because you need everyone to make the switch at the same time. “Most people are resistant to change and may hang on to using the old system because they are more familiar with how to use it,” she said. But if half of your salespeople are still logging data in the old CRM after the switch, they’ll end up losing all that information. Before you begin the task of migrating your data, ask your sales reps to clean up their pipelines. Sure, it’s not the most exciting project — but why take old records with you if you won’t use them? “You want to start using a new system with data that’s as clean as possible,” Harmon said. Although this process might be time-consuming, starting fresh with your new CRM will help your sales managers “drive the business forward,” Vajre said. Saying goodbye to your current CRM isn’t easy — even when your organization has clearly outgrown it. But you’ll have to do it eventually, so reduce the friction of switching by getting support from 100% of your sales team, figuring out all the key details well in advance, setting (and sticking to) a deadline and cleaning out your pipeline.